I hope you are enjoying your summer and take some time to relax with your friends and family. Keep reading for LOTS of great information! Let’s break this whole “free” concept down. If you order 300PV in Young Living items this month (we’ll give you some ideas of what you could order at the bottom of this post), they’re going to throw in $207.23 (retail value) of items just because they’re apparently insane and really like giving things away. So maybe you don’t buy a bunch of toxic cleaners, lotions, and shampoos at your local store, and you also don’t accidentally spend $207 on new throw pillows, a bathrobe, and a foot spa, AND you also don’t endure tears from your toddler when they see Zazzlemintabubba gum in the checkout line. Instead, you order products that will benefit your health and you get $207 of other goodness free…on your doorstep…without tears…or gum in your child’s hair. – We refer to Aroma Life as the heart’s friend. Both physically and emotionally, this oil is going to encourage healthy heart function and all the body works that go with that. – Apply Aroma Life to your wrists and over your heart to bring an empowered feeling to your day and help you push through the barriers that hold you back. – Energize your spirit and create a sense of connection by diffusing Aroma Life in your bedroom as you begin the day. – Keep in your first aid kit and apply topically to trouble areas. Breathe deeply for calm and comfort. – Apply to wrists and breathe to release emotions of people pleasing and comparison. – Diffuse Geranium for an uplifting aroma when you dive deep into your soul and spend a moment reflecting on what you’ve achieved. – Add a comforting aroma and a feeling of fearlessness to your home or office the next time you have to hustle. – Keep on your desk at school or work to face challenging assignments, tasks, and tests. – Do something adventurous! Climb a new summit, try a new hobby, or meet someone new. Whatever you do, be sure to bring your trusty friend Valor. – Apply Valor to your neck and chest after your morning shower to get excited for a new day full of opportunities. – Diffuse or apply to feet at night to encourage deep rest. – Head outside and let the great outdoors inspire you while you reconnect with nature. Wherever you wander, stay cool with LavaDerm Cooling Mist. – Add extra moisturization to your evening routine by spritzing your face with this gentle mist before bed. – Drop under tongue to support the respiratory system before spending time outside. – After a day of tackling obstacles, add 2 drops to a capsule before bed to support general wellness and promote a restful night’s sleep. – Reward yourself for all your hard work with a view of the sunset and a drop of Lavender Vitality in your favorite lemonade. If you only spend 100 PV (only on ER), you also miss the Valor. If you’re not on Essential Rewards, we have failed you miserably as your friends, and we are so sorry. Please fix that sadness. *Reminder, as you build your Essential Rewards order, you become eligible for each promotion level. Start stocking up! Here’s what’s currently in stock and ready to be added to your ER cart! Pulls out dirt and impurities w/o stripping skin’s moisture barrier. Cleanses and deodorizes body and is suitable for face soap for oily, combination, or acne-prone skin. Low gluten content, can grind to make flour or use whole as a base for salads and porridges. Supports and maintains healthy digestive and immune system while promoting healthy bacteria in the gut by colonizing GI tract. Support against digestive discomfort, diarrhea, gas, and bloating and constipation. Clean, spicy, and woodsy scent. Some of our favorite ways to use it are: soothing fatigued muscles, reducing the appearance of blemishes, and purifying the air from unwanted odors. that runs 5-8 hours, 10 hours on intermittent. Maximum strength salicylic acid. Treats and prevents acne, blemishes, pimples, and blackheads. Prevents sunburn for ALL skin types, including sensitive skin, non-greasy, reef safe and 80 minutes water and sweat resistant. Softens + moisturizes skin with Sandalwood, Jasmine, + Rose w/ Jojoba and Argan oil. Removes makeup, and water-resistant sunscreens. Improves manageability, softness, and shine while minimizing frizz, flyaways, and tangles. Leaves hair silky and glossy. Created with sensitive skin in mind, reduces oily skin, removes dirt, and leaves skin clean and soft. Hypoallergenic and vegan-friendly, preps face for makeup while soothing, softening, moisturizing and calming skin. All the new Savvy Minerals faves! If you haven't enrolled in Essential Rewards yet, I strongly recommend it! Enjoy the convenience of an automatic monthly shipment! THIS takes one more thing off of your todo list! 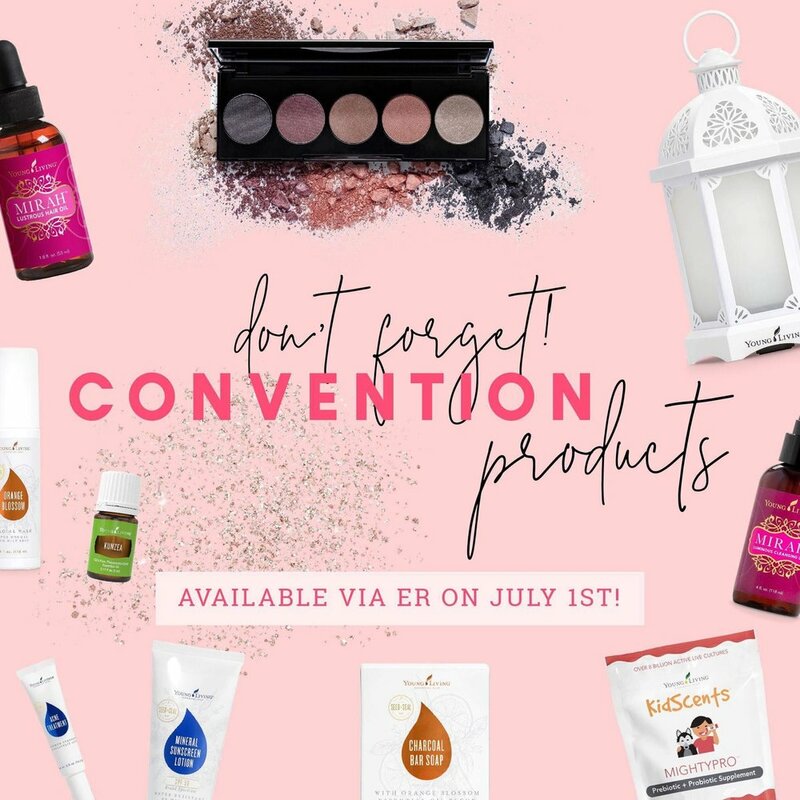 [YES PLEASE] Just set up your order and kick back while all of your favorite products are sent right to your doorstep, month after month! This is the real kicker….Not only do you get 24% off already as a MEMBER of Young Living, but when you join ER, you also get an additional percentage back ON EVERY ORDER! 10% right away then 20% back on everything just a few months after you join. The FIRST THREE months that you are an ER member, you earn 10% back on your ER orders. So if you place a 100PV order, you earn 10PV ($10) in points to buy free oils and products, which is like getting everything you buy at 10% off. Every month, Young Living will give a set of free oils with qualifying orders depending on what is spent. They are called the Monthly Promotions and we always have them listed in this newsletter! Signing up for ER is SUPER simple and can be done in your Virtual Office at youngliving.com. Let us know if we can help you!! If you already are buying every month (while this program is completely optional), you will get all those amazing perks! Now that you have your kit, you have officially started your journey! We are here to guide you every step of the way, but first we want to invite you to open up those cute little bottles of goodness and start putting them to good use! Go to this class on the website to learn even more. 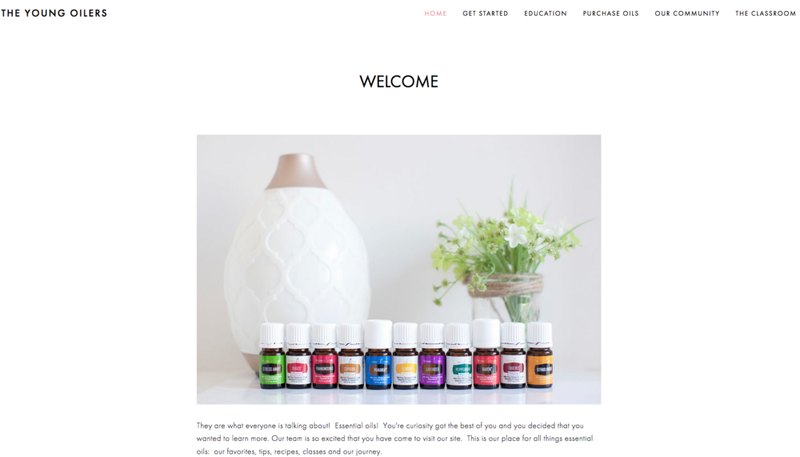 July 20th - Essential Oils 101 - Public Class - link coming soon. *Please contact me if you have questions, ideas, etc. about The Classroom. **Be sure to always check in with our facebook group and brand new facebook page for updated links for individual classes. It's time to share your passion essential oils with others! We don't SELL anything. We SHARE our love for these amazing products! JULY HELP 5!!! Win this beautiful Young Living Clutch! Now that we’re in July, we have a new incentive from Young Living! All qualifiers this month will receive this super cute gift!!!! These Help 5 Challenges are so on point!!!! Our paycheck is our incentive. Our paycheck is our reward … cause this is our job. This? This is extra, from a company that always goes above and beyond! They’re helping us even more in focusing on the most important parts of the biz: enrolling and ER!!! 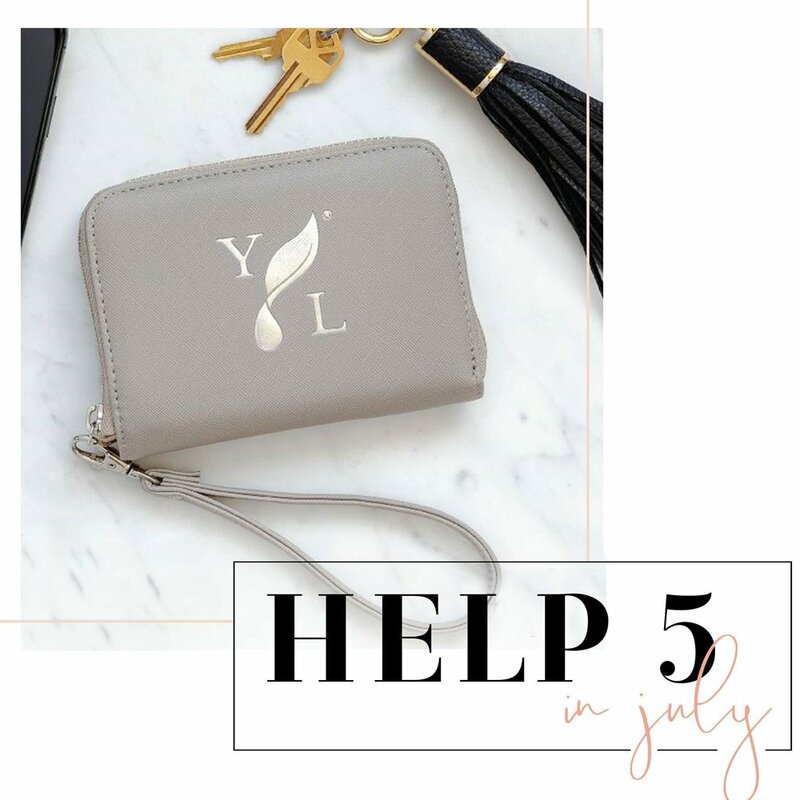 July’s Help 5 incentive is for U.S. members only. Did you know that for EVERY SINGLE PERSON who signs up as a member with Young Living & a PSK, you receive $50? And, then when that member begins ordering on a monthly basis, you will begin earning a commission? We all want that extra Starbucks money right? I'll be sharing a LOT more with you about how to get involved in the business and never have to SELL anything! Thank you for joining us on this amazing journey of Wellness, Abundance and Purpose!